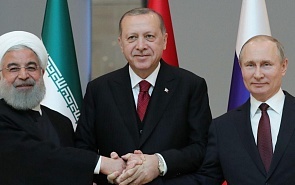 The meeting of presidents of Russia, Turkey and Iran on April 4 in Ankara promises to bring extremely important agreements on the fate of Syria. Apparently, there will be also a discussion on the achievements in all their complexities and interests. Much has changed not only in Syria itself, but also in the international context. By the end of March, the Russian military reported on a successful operation of evacuating the population through the humanitarian corridors in the East Ghouta (153.4 thousand people, about 29 thousand of them were evacuated through the Muhayam al-Wafidin corridor). At the same time inhabitants of the liberated neighborhoods return to their houses (already more than 40 thousand people). Militants of "moderate" formations (Failak Ar-Rahman, Ahrar al-Sham, etc.) also leave Ghouta and Douma (more than 2.3 thousand militants and their relatives have already left in the direction of Jarabulus). The exit conditions for Jaysh al-Islam radicals are yet to be discussed and implemented. They must provide maps of minefields for mine clearance, hand over medium and heavy weapons, and clear roads of the enclave. All these measures are taken within the framework of the Russian initiative on humanitarian corridors with reference to the UN Security Council Resolution # 2401, taking into account the results of the Sochi round of the Congress of the Syrian National Dialogue. The Turkish authorities for their part announced the liquidation of more than 3.8 thousand extremists in Syrian Afrin, proclaiming the city and the entire region around being liberated. But the planned attack against the Kurds in Manbij can meet the resistance from the US military, which reinforced the garrison. The Americans apparently try to delay the Turkish forces’ advance, which should hesitate to fight the American soldiers. Anyway, the Turks now have combat successes, so they will try to pay themselves for the fight against terrorism. These are the trump cards and the participants in the tripartite summit could use them to promote their initiatives. But this time, perhaps, these trump cards will be laid not against President Trump, as his proxy allies can come to the regional forefront. The Trump administration, even in its contradictory manner, seems to change the format of the American presence in Syria. According to Donald Trump, the US military can leave Syria "very soon", the time has come, and others should take care of Syria. The US will choose the allies conformable to this purpose. The first in the row is the Saudi ruling house, as several facts testify eloquently. First, these are the results of the recent visit to the US of Crown Prince Muhammad bin Salman Al Saud. He promised to double the investments in the US economy, bringing the 10-year program to $400 billion, 55% of which will cover the military cooperation. Second, it is a reversal of the Saudi crown prince’s rhetoric towards the Syrian president (simultaneously with the change of White House's intentions). In particular, during the meeting with Trump prince Salman bluntly stated that "Bashar can remain" - however, on the condition of the alleged limitation of the Iranian influence in the country. One could assume that Riyadh will concentrate its efforts on the financial and economic expansion in Syria with the background of possible post-conflict reconstruction program. This soft power should quickly lead to the cherished result for the Saudis - the withdrawal of Iranians from Syria and weakening of the Lebanese Hezbollah. Avoiding "putting all the eggs in one basket", Donald Trump tries to diversify the American proxy actions in the region. France, the US European partner, is ready to take charge of the Middle East initiatives, apparently, “with a little help” from another Crown Prince - Mohammed bin Zayed Al Nahyan of Abu-Dhabi, with whom Emmanuel Macron met several times during 2017. The French president put forward his own initiative for the Syrian crisis settlement. Moreover, France coordinate with Washington not only the well-known plans for Syria, but also its Middle East economic plans in general. It is possible that such a dual control strategy will be effective in advancing American interests in the Middle East indirectly, taking into account the regional hidden "division of labor," both in European relations (for example, the Anglo-French initiatives) and in the Middle East (Saudi Arabia-UAE). So, the defense of their interests on the Syrian soil by Americans and their "double-proxies" seem to shift further toward the diplomacy of money (or their deprivation), moving away the diplomacy of direct military force. The chosen tactics is likely to oppose the successes of Russian weapons, being intended to demonstrate the alleged old-fashioned approach of the Kremlin, when the Russian president substantiates the power of Russia with new effective types of weapons. Meanwhile, the strategy of the leading western players looks like a "coalition trend", even with the help of a multifaceted pressure on junior partners at the expense of their economic and image losses. Despite this, bilateral contacts with Russia are developing even against such pressure and regional collusions. In particular, one can agree with the opinion of some clearheaded experts that the diplomatic flash mob organized by the Great Britain (the Skripal affair) does not affect the planned Russian-Saudi economic projects discussed during the visit of the Saudi king and the Crown prince to Moscow last fall. The Kremlin's position and the growth of Russia's military potential cannot be discounted in the Middle East debate. During the summit of presidents of Russia, Turkey, and Iran it will be necessary to take into account the shift in the United States policy paradigm France and Saudi Arabia are ready to implement in the changed conditions.